As part of Invest Syracuse, a $100 million initiative designed to advance academic excellence and the student experience, Syracuse University today announced steps it will take to enhance mental health counseling and services on campus. Following significant discussion between University and Student Association leaders, the Counseling Center is piloting extended hours of operation for the spring 2018 semester. This semester, searches will also begin for four additional staff therapists and a psychiatrist. With the increase in staffing, there are also plans to create a Counseling Center satellite office at 111 Waverly Ave. The increase in staffing and extension of hours are part of broader efforts to strengthen and increase access to health and wellness services. “Mental health is a critical component to addressing students’ holistic health and wellness needs. By extending hours, increasing staffing and providing group therapy options at later hours, we can increase the reach and opportunities for students to access the care they need and better support their capacity to be successful inside and outside the classroom,” says Dolan Evanovich, senior vice president for enrollment and the student experience. “Mental health is integrated into every facet of students’ lives—from academics, social lives, and more. It’s often a crucial component and antecedent to a dynamic and successful education. Therefore, over the past few years, mental health has been a key priority for Student Association. We have worked with University leaders and campus partners to lead and discuss initiatives surrounding mental health, such as Mental Health Awareness Week. 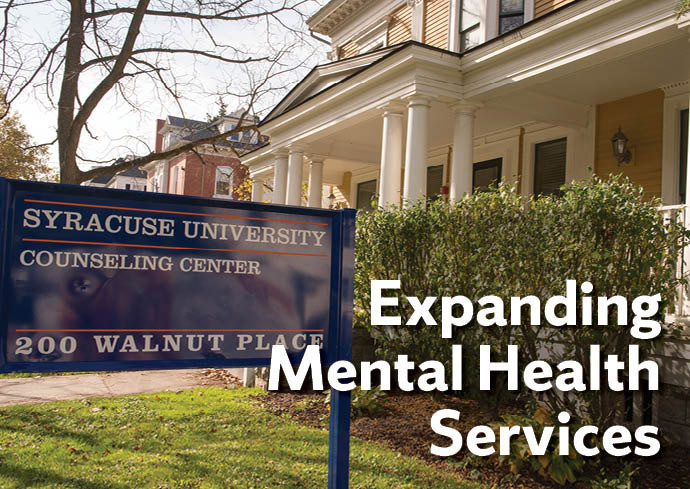 We are excited about these additional investments in mental health services and counseling because they not only increase access to essential resources, they also convey a powerful message that no student is alone, each student’s mental health is valued, and every student deserves help if they need it,” says Angie Pati ’18, Student Association vice president. On Mondays and Thursdays, the center will remain open until 7 p.m. to accommodate more scheduled appointments. Additionally, the Counseling Center will host two evening group therapy options on these days. With extended hours, the Counseling Center increases its capacity for scheduled counseling appointments, as well as broadens its hours of operation in ways that may be more convenient for students. The extended hours, increased appointment slots, and additional staff therapists can also support efforts to reduce wait times. Coupled with the recently released new group therapy schedule, the Counseling Center is looking forward to a robust spring 2018 schedule that offers more opportunities for students to seek mental health counseling. Supporting Students with Anxiety, a weekly group for students experiencing symptoms of anxiety and difficulty with stress management that will be offered Mondays, 5-6:30 p.m.
To join a group, students must first contact the Counseling Center at 315.443.4715. Students will complete an orientation session prior to starting group. For more information on the different group therapy options, visit the Counseling Center’s Group Therapy webpage or contact Dr. Brown at clbrow01@syr.edu.